This was taken less than five minutes after I crossed the finish line, which is why Al had his medal on and I didn’t. I hadn’t gotten mine yet. I think the smiles on our faces say it all. Neither Al or myself imagined crossing the finish line in the times we did. And I know I probably shouldn’t even say this, but I am going to. Our times may not be fast to some and we aren’t ever going to win a half-marathon race, but to us, we don’t care. Some will look at our times and probably chuckle (well, my time anyway), but to us, we don’t care. We were happy – ecstatic, really – about our times. Seriously. We BOTH teared up at the end. We don’t compare ourselves to others (for the most part!). We compare ourselves to ourselves. We are always striving to be better than the last race or at the very least, be close to it. This race for the both of us couldn’t have gone any better. It was THE BEST to date. So, what were our times? 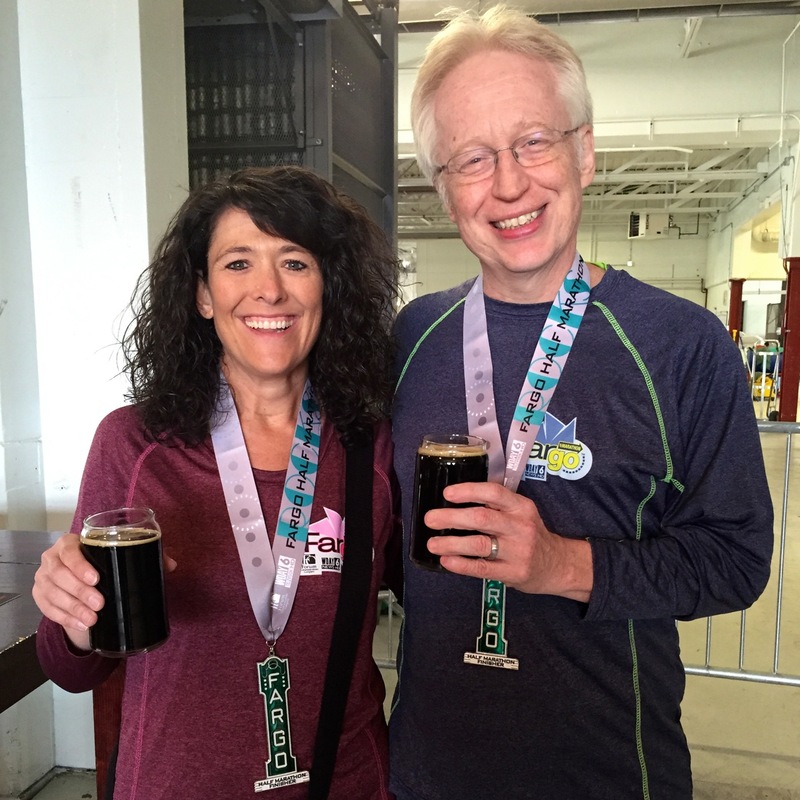 And, here’s a look at all of our half-marathon races since our very first half-marathon, which was the Rock-n-Roll Half-Marathon in Las Vegas, Nevada. So, if you compare our previous PR half-marathons (Al’s was the San Jose race and mine was last year’s Fargo race), Al beat his time by 2 minutes and 59 seconds and I beat my time by 7 minutes and 54 seconds. Pretty impressive, huh? 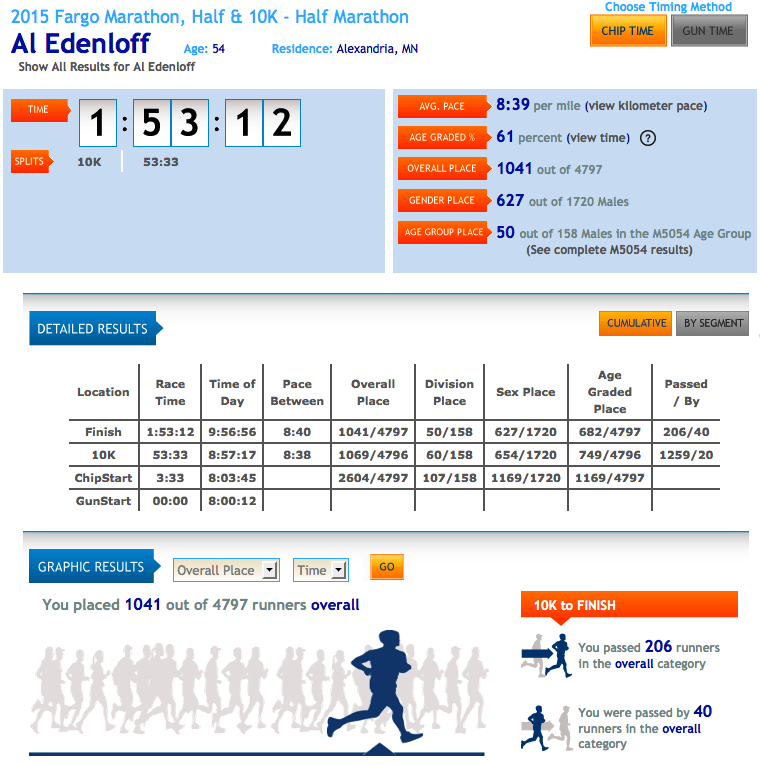 Then, if you really want to be impressed, since our very first half-marathon, which was in 2012, Al’s time improved by 12 minutes and 33 seconds. Now I know it’s not really fair to compare because the course was different, the weather was different and so many other factors, but for us, it’s still a fun comparison! We know it’s not like comparing apples to apples, but who cares, it’s still the same distance – 13.1 miles! 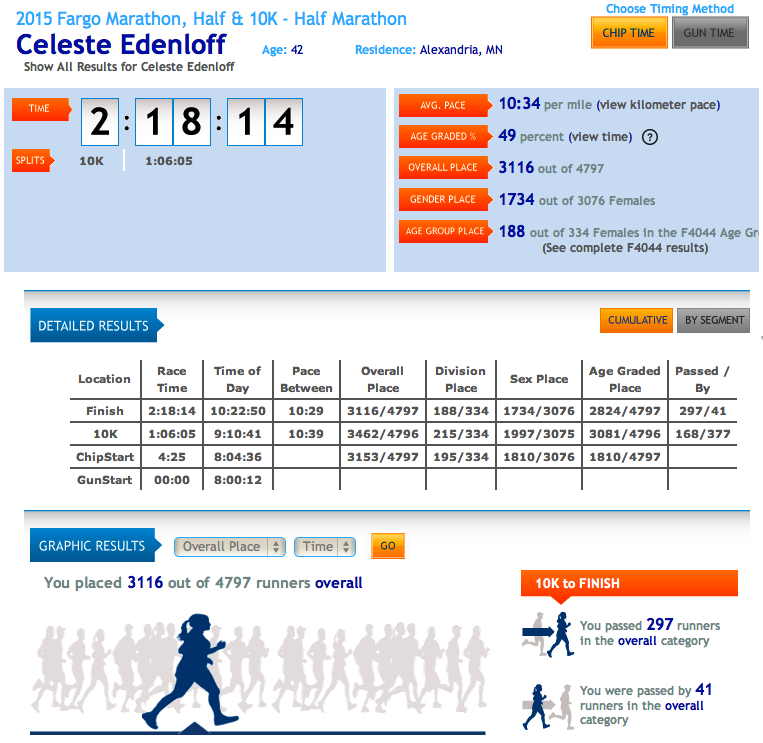 For me, I improved my time by a whopping 41 minutes and 43 seconds. Wait, what?!?!?! 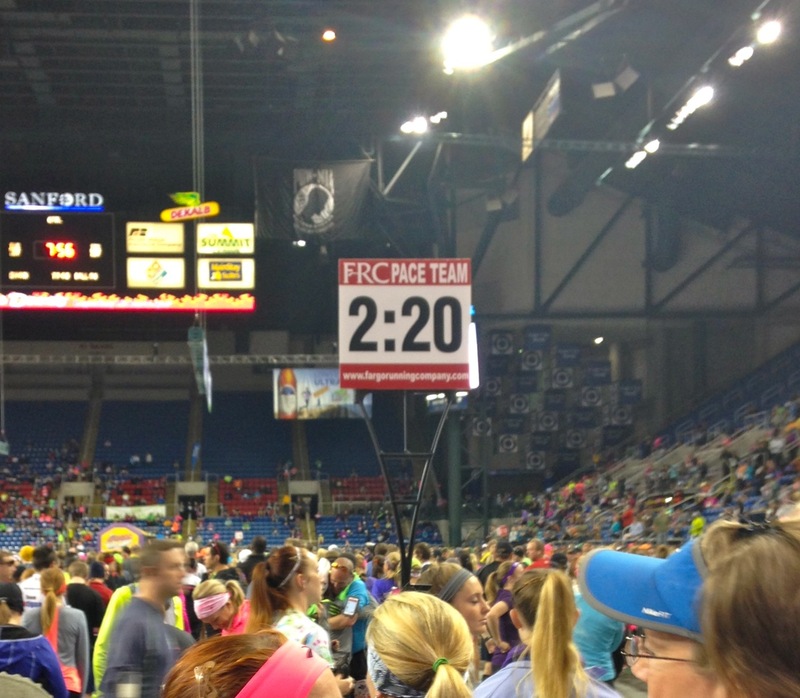 Yep, I shaved FORTY-ONE MINUTES AND FORTY-THREE SECONDS off my time. Talk about craziness, huh? It’s unbelievable, really. I received some great feedback. First off, if you don’t know what a pacer is, click HERE to read about it. Basically, the pacer helps you reach your goal. After reading some of the comments on my question about running with a pacer, I realized I needed to talk with the pacer group to find out whether or not the pacer did a combo walk/run or if he/she kept an even pace or basically, how the person planned on getting the group to its goal time. 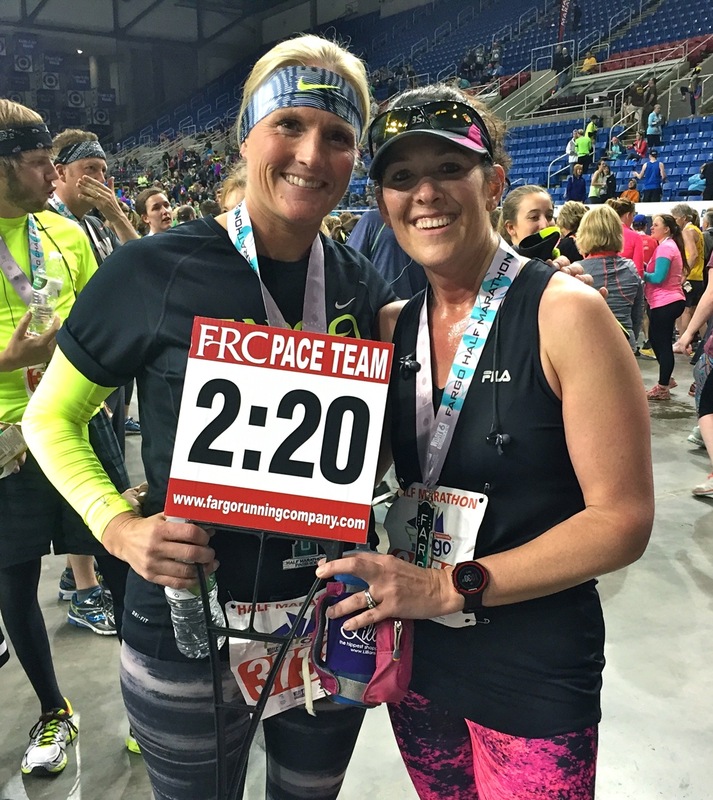 While Al and I were at the race expo on Friday afternoon, I found the pacer group, Minnesota Pacers, which I think were either members of The Fargo Running Company or somehow, someway affiliated with the Fargo-based running store. I think they all had the Fargo Running Company shirts on, or at least some of them did. Anyway, we talked to a guy and he answered all of my questions, which was very helpful. Although at that point, I still hadn’t made up my mind on whether or not I was going to try running with the pace group or not. Running with Kari, although really, she didn’t realize or even know I was running WITH her, was the best thing I have ever done at a race. All my focus was on the 2:20 sign. I knew I wanted to keep it in my sight at all time. I kept an eye on the people in front of me and the road below me, as well as all the awesome cheering fans alongside me, but to be honest, I really was just paying attention to Kari, her blond ponytail swinging left to right and the sign that kept bobbing up and down with the swing of her arm. My watch beeped and we were already at mile 1 and then it beeped again and again and again, miles 2, 3, 4. I couldn’t believe it. It seemed to be going by so fast, although I didn’t feel like I was going fast. I didn’t feel like I was breathing hard or struggling or anything. It felt good. It felt great. It felt – ALMOST – effortless. Okay, not really. I mean, come on, I was running. Running isn’t effortless for me! But it really, truly felt good. Literally, all I was thinking about and focusing on was the sign. I had to keep it in my sight at all times. I really didn’t stay too far back, but there were a couple of times Kari got a little more ahead of me than what I wanted. At those times, I just picked up the pace and tried to keep up as best as I could. It truly wasn’t as big of struggle as I was expecting. As we approached the water stops, Kari did slow way down and even walked a little bit, but I just kept on running. At times, I slowed my pace way down because honestly, I didn’t want to get too far ahead. I kept repeating over and over in my head, “Trust the pacer. Trust the pacer. Trust the pacer.” I did this during the times I wanted to speed up because I was feeling so good. But the reason I didn’t is because I didn’t want to peter out toward the end. Again, I kept telling myself to trust the pacer. She was going to get us across the line in two hours and twenty minutes. That was her job, her goal and her promise. Well, before I knew it, we were at mile 10. Truly, I couldn’t believe it. I wasn’t tired. I wasn’t struggling. Okay, I did have this pain that started up in my right leg, in the inside crease of where my leg connects to my hip and also on the outside back area, you know, right under my right buttcheek! I told myself to ignore it, to push through it, that I didn’t come this far to not reach my goal. I was going to finish this race in 2:20 or else. To be completely honest, I was shocked that I kept up with Kari and the 2:20 group. I didn’t expect I would. And I didn’t expect I would with as much ease as I did. By mile 11, I was still feeling pretty good, surprisingly good. I knocked around the idea of pushing ahead of Kari and just going for it – giving it my all for the last couple of miles. But then my thoughts turned to what would happen if I pushed it and then petered out and the group passed me at the end. Instead, I made a deal with myself. I told myself that if I still felt as good at the end of mile 12, I would push it and give it all I had for mile 13. And guess what? I did just that. When I knew I only had one mile left – well, one point one miles left – I darted away from the group. I charged forward, giving it everything I had left. All the while, tears welling up in my eyes. At that moment, I knew I was going to finish in less than two hours and twenty minutes, it was just a matter of how much less. I couldn’t believe it. I went into this race with a goal of 2:25 something. I really, truly didn’t fathom that I could do it in 2:20 something. I really didn’t. Anything under that was a pretty dang lofty goal. As my Garmin beeped the 13th mile, I pushed even harder. I gave it everything I had. I mean everything. I came into the FargoDome with gusto. I actually had enough gas left in the tank for an all out sprint at the end. I felt amazing. I felt good. I felt proud. I felt pain – in my stupid right leg, but at that point, I actually didn’t care about it. I crossed the finish line Rocky Balboa style, arms flailing in the air, fist pumping and all. Tears and the largest dang smile I could muster plastered on my face. I did it. 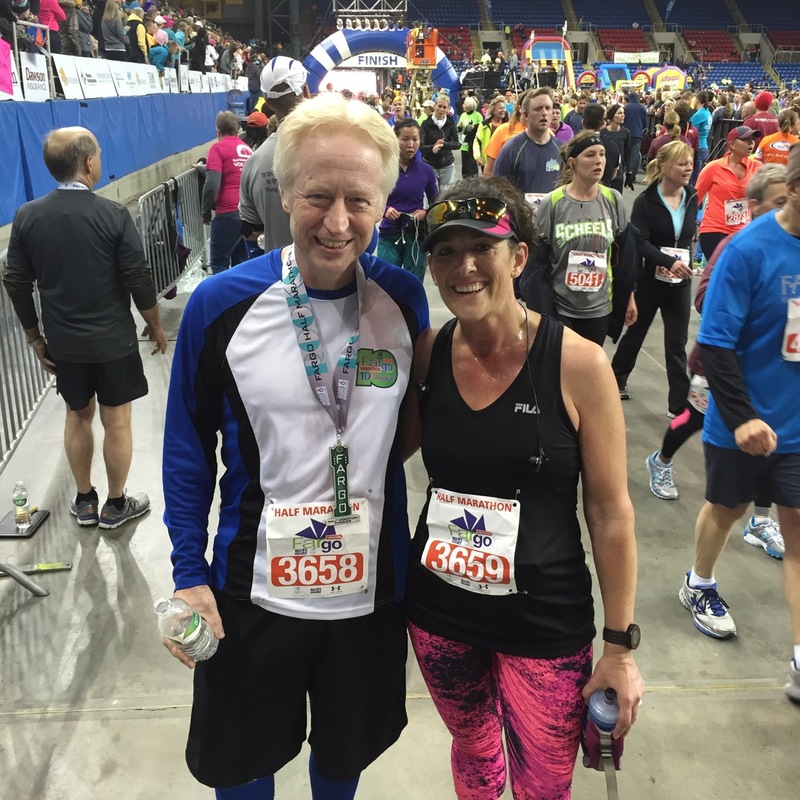 I ran 13.1 miles – or according to my Garmin, 13.23 miles – in two hours and eighteen minutes. My official time, 2:18:14. An average pace of 10:34. If you really want to see the details of my run, including my splits, which are pretty awesome, click HERE. I found Kari at the end and had Al take our picture. Thank you, Kari, for pushing me even though you didn’t even know you were. Thank you, Kari, for keeping me on a pretty even pace, even though you really didn’t know you were. Thank you, thank you, thank you! I honestly don’t think I could have gotten the time I did without your help. I will definitely use a pacer again. It was a great experience. I am so glad I put my trust in her! THANK YOU TO MY CHEERERS! Another HUGE thank you goes out to all my cheerers – Deb, Wendy, Becky, Krista and Natalie. And thank you to Tonya for trying to cheer me on even though her cheers didn’t come through. 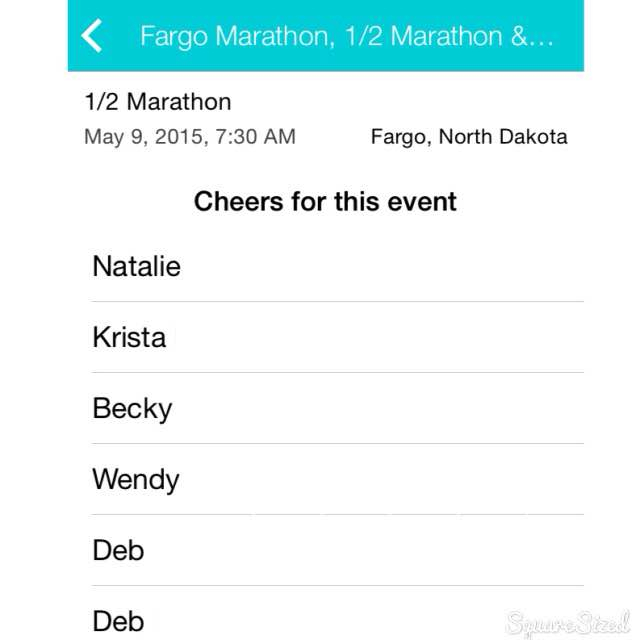 These five ladies used the Motigo app, the one I talked about in my last blog post, and sent me messages. It was so awesome to hear their voices come on at different times during the race and listen to their inspiring messages. And yes, every single one left me teary-eyed and smiling a big-time smile. Runners next to me may have been wondering what the heck I was listening to, but I didn’t care. And, I will admit, I have listened to them a couple of times since the race. These messages mean more to me than the senders will ever know. THANK YOU again, ladies. You made my day and made my race! One last picture to share…at the Fargo Brewing Company drinking one of my all-time favorite beers (Sodbuster) with my all-time favorite guy! And yes, it was DELICIOUS! Here’s to the next half-marathon! Maybe, just maybe, I’ll try for a time of 2:15 or less! Wow congrats on an awesome PR! I’d kill for a half time like that. Right now I’m training for a half that I’d like to finish under 2:30 – my current PR is 2:30:35 and I can’t handle coming that close and not getting it! It sounds like you had an awesome race day! That’s the wonderful thing about running: Sometimes we really surprise ourselves! Of course you know by now that anything is possible if you set your mind to it! Congratulations on your PR! Congrats! What an accomplishment. Can’t wait to hear how you do on your next half. Whoop whoop! Congrats to you both on your PR’s. I loved the post, your enthusiasm & positivity. This makes me want to get out there & run. Of course I also can appreciate your celebratory beer. Cheers indeed! Great Job on both your times! The fargo Race is amazing and quite an experience!